February 4, 2015 March 3, 2015 - by S Z - 5 Comments. Arrhenius plots are often used to determine the activation energy (Ea) and A factor (A) by a linear fit of the logarithm of Arrhenius’ equation. Where k=Rate constant, R=Gas constant, T=Absolute temperature(K). An Arrhenius plot is to plot ln(k) versus 1/T. A linear regression on Arrhenius plot will solve intercept which corresponds to ln(A), and the slope which corresponds to -Ea/R. 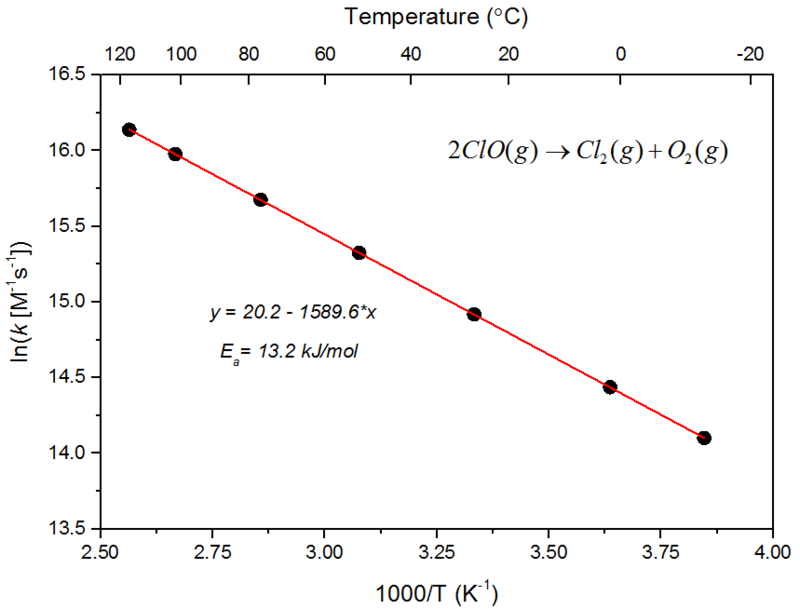 Here we will show you how to make an Arrhenius plot from raw data, and add a linked secondary top axis as experimental temperature (0C). Feel free to download the sample project: Arrhenius plot Sample.zip. The data is obtained from NIST. Go to Folder1 Book1. 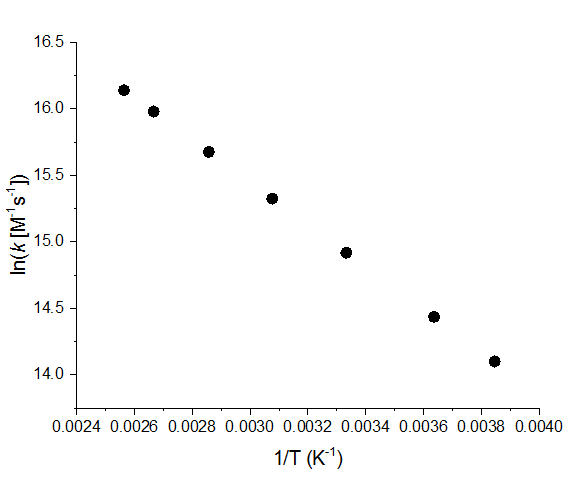 The raw data is a set of measured rate constants (M-1s-1) at different temperatures (K) for reaction 2ClO(g)–>Cl2(g)+O2(g). Select col(C) and col(D) to make a scatter plot. Usually x axis will be plotted as 1000/T. 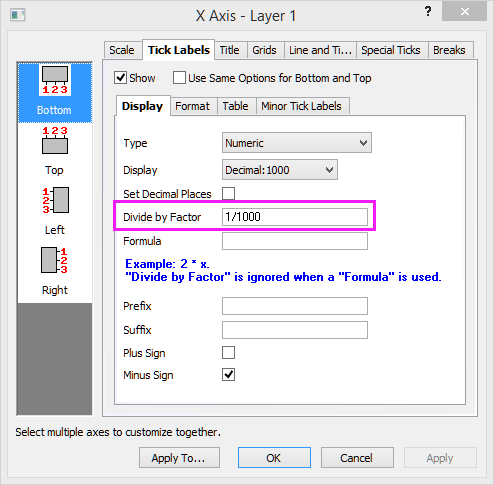 We can add a Divide by Factor in Axis dialog to show as 1000/T. This will not alter the actual data. Update axis title as well to be 1000/T(K-1). 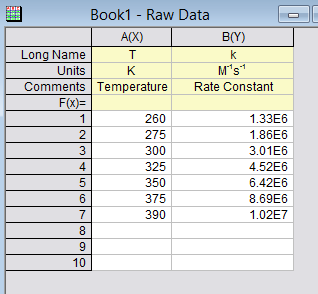 To add a secondary top X axis to display temperature at unit of Celsius, click on Add Top-X Layer button on Graph toolbar to add a layer with top X axis only. The formula to convert Kelvin to Celsius is oC = K – 273.15. Since our original X data are in 1/T unit, the equation become Xtop = (1 / Xbot) – 273.15. 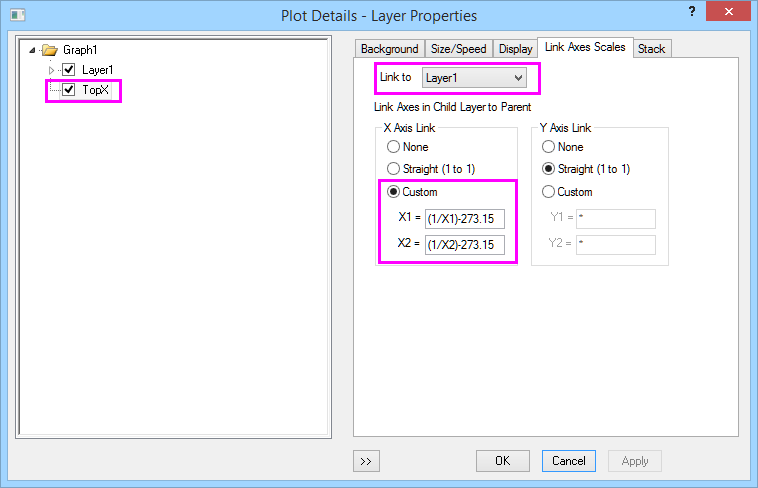 In Plot Details dialog. 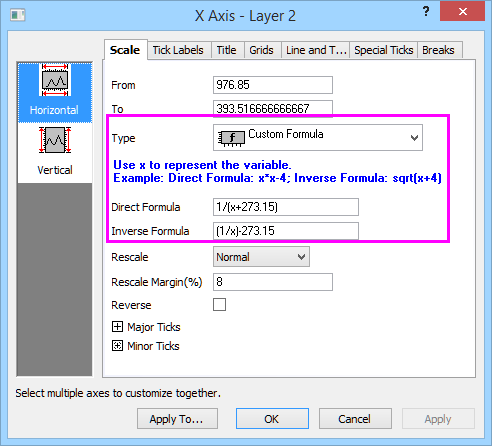 Select TopX node on the left and go to Link Axes Scales tab to set the formula between bottom axis of layer 1 and top axis in layer2 as follows. X1 and X2 in formula refer to the Start and End value of bottom X axis. 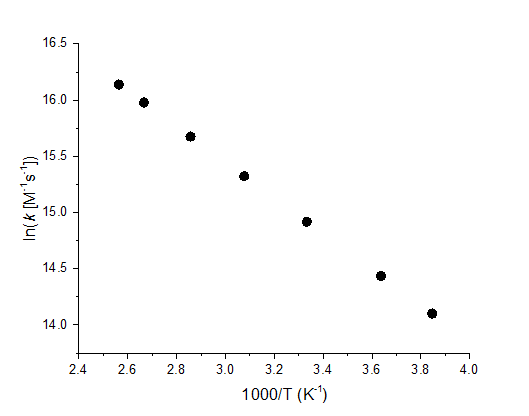 what is the significance of log K+3 in Arrhenius plot? The growth rate (y-axis) should be a log scale, not a ln scale! Almost no one will accept or be able to interpret an axis label in powers of “e”. The rate data cover a range of only 6 to 1 so a log scale would be much better anyway. Thanks for the comment. We have modified the blog now to use new data. I do not know about the usual representation of growth rates, but a ln scale is the only valid option for an Arrhenius plot (which is discussed here) if one wants to be able to – correctly – linear fit an Arrhenius law. Sadly, Arrhenius plots are often represented in log scales which makes no difference to the eye, but in my opinion trying to linear fit for an Arrhenius law and measure an activation energy in such a scale is erroneous.